Located on the southern shores of Port Stephens. Nelson Bay is a coastal resort town of approximately 5000 people located just inside the mouth of Port Stephens, a large natural harbour. Despite its growing popularity the town, treads a sensible line between tourism and charm. Nelson Bay, the largest town of the Port Stephens area, is 223 km north of Sydney via the Pacific Highway, 69 km from Newcastle by road and 18 m above sea-level. The origin of the town’s name is not known. It may have derived from the boat the Lady Nelson used by Governor Macquarie in 1812 when he came to visit the Port with an eye to establishing a settlement which never eventuated. A group of Chinese fishermen established a base here early in the 19th century. They cured their catch and sent it back to China and to Chinese merchants in Sydney and Melbourne. The first survey of Nelson Bay was carried out in 1874. A post office and school were established in 1883. By 1886 there were about 30 residents. The villagers led a rather peaceful life based around fishing (still important to the local economy) until developers arrived in the late 1960s. Today Nelson Bay has everything the visitor could want as far as facilities and aquatic recreation goes. The diving and snorkelling here is exceptional. Just east of Nelson Bay, the tiny promontory of Fly Point is an aquatic reserve with prolific marine life. Divers have another superb site just off the coast at Broughton Island, with such outstanding features as the ‘Looking Glass’, a split that runs through the middle of the island, crowded with marine life. At the eastern end of Nelson Bay is an elevated piece of land known as Nelson Head which separates Little Nelson Beach to the west from Shoal Bay to the east: the latter being another popular spot for holidaymakers. On Nelson Head sits the Inner Lighthouse, dating from 1872 but still operating and classified by the National Trust. Originally lit by three kerosene lamps electric lights were installed in 1946. The system was recently automated. The cottage was built in 1875. This small cluster of buildings incorporates a modest historical display. There are also films, panoramic views, a tea room and a gift shop, tel: (02) 4984 2505. How far is Nelson Bay from Sydney? Nelson Bay is just 210 Kilometres from Sydney – Just 2 hours, 30 minutes. 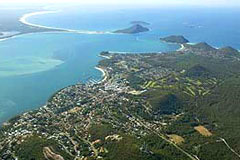 Nelson Bay is the major town servicing the smaller towns around the coast of Port Stephens.